Ankle tattoos is the latest trend catching up this year. Ankle tattoos can make your legs look beautiful. Even though this trend is catching up very recently, ankle tattoos have been around for a long time. Ankle tattoos have come back in many different shapes and designs. Ankle tattoos that surround the ankles grab a lot of attention to the legs, making them delicately flirty. Ankle is the ideal place to get a tattoo done on your body as you don’t have to worry a lot about the repercussions since you can hide the ankle under the boots or socks. Lot of ladies gets inked on the outer ankle, but there are many more preferences. The inner ankle is the preferred area for simple cute tattoos and for a fantastic look you should get inked on the flipside of the ankle. To get one of the ankle tattoos done, you will need a lot of commitment. The process itself can be painful depending on the area where the tattoo is done. The final result is worth looking. This ankle tattoo is good if you want to carry a phrase with you always. These phrases can be anything from inspirational quotes or something that you want to keep closer to you. In a cute font, this can be written on your ankle. This is perfectly feminine. The fonts can be personalized to suit your style. 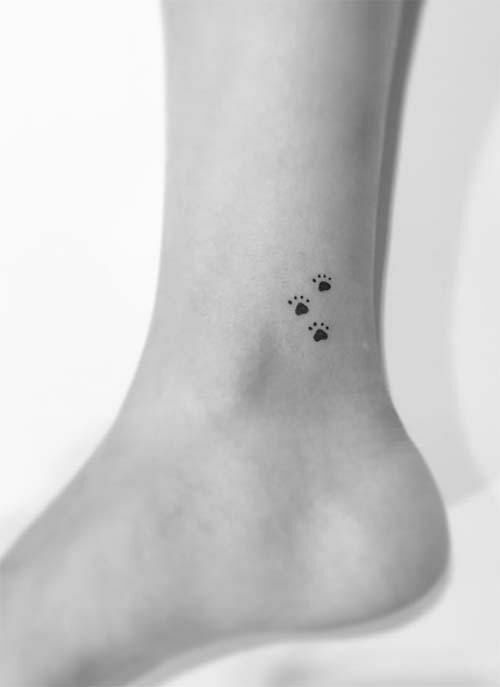 If you love dogs and love them to death, then this tiny and cute little paw prints design is a great tattoo especially if you have pets in your life. This is a very cute idea as well. This one is a very cute little tattoo. 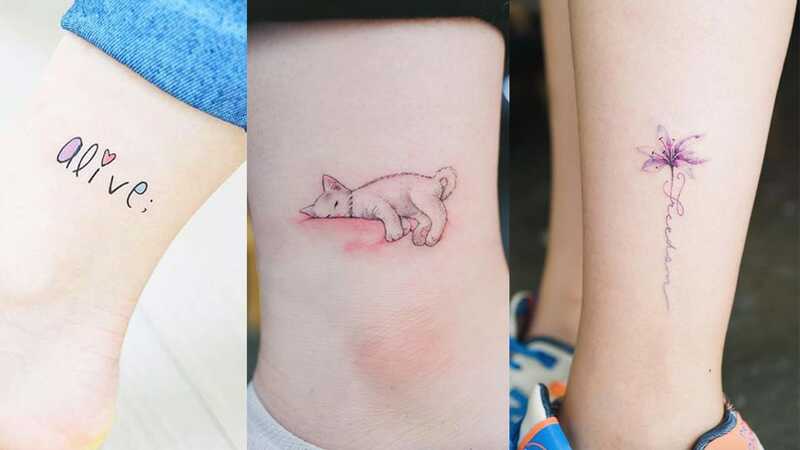 This adorable dog ankle tattoo will make you smile every time you look at it. 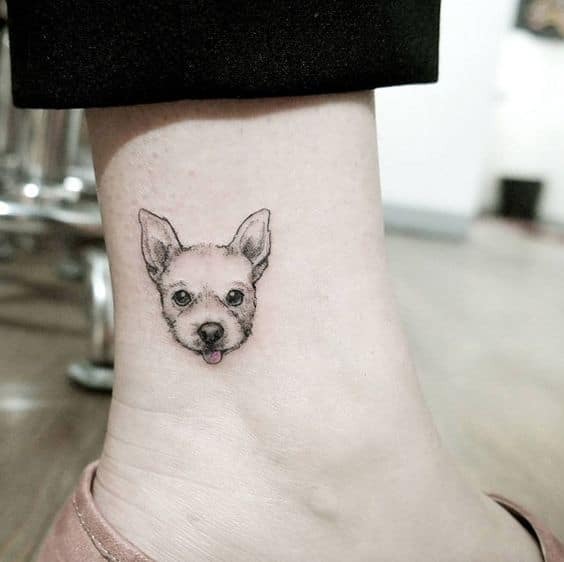 You can create this ankle tattoo with a nice picture of your favorite dog or puppy. 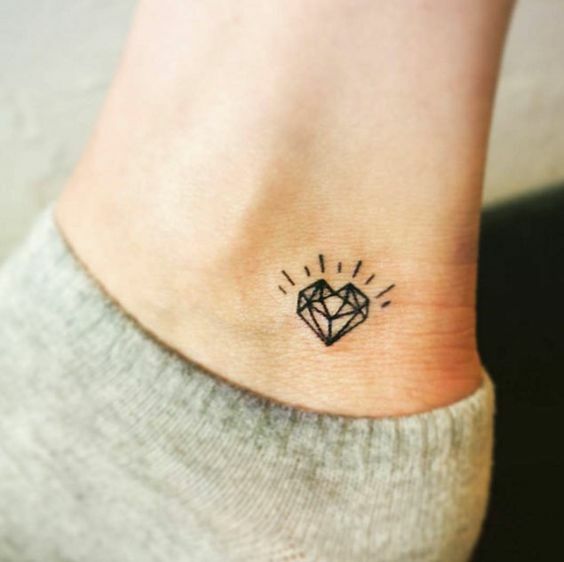 The Diamond heart ankle tattoo is one of the classic and feminine ankle tattoos. This tattoo is geometric and cute. This looks pretty interesting, is subtle and vibrant. The heart on top of the diamond makes it all the more adorable. The deer image takes your thoughts to nature and wildlife. 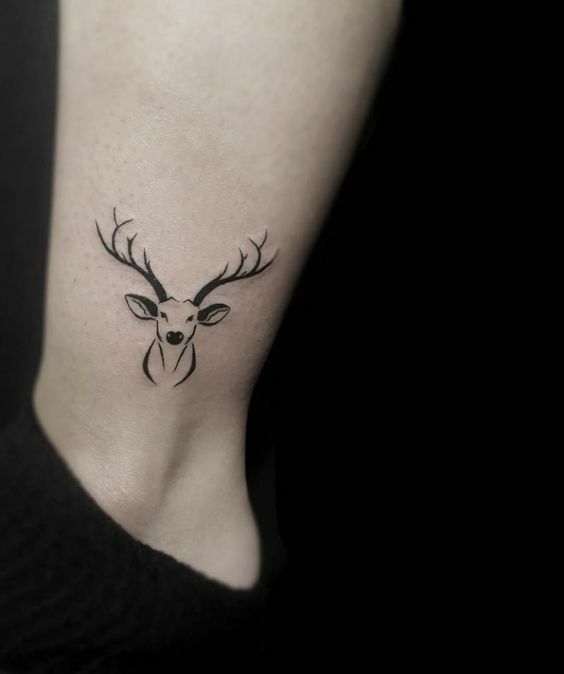 The cute deer tattoo is ideal for women who love the outdoors or just loves deer. This is a simple design to create and won’t take a long time to ink the area. 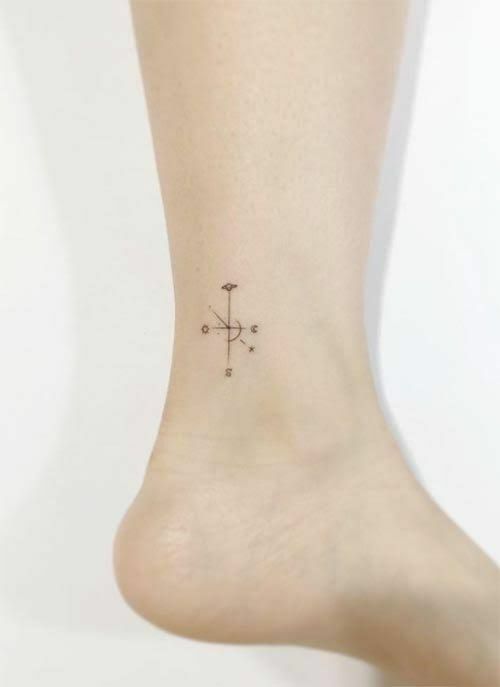 This is a straight line ankle tattoo. It is pretty easy to make and looks sleek. The scaled icons bring design to life. Maybe this design will help in providing some direction to life. Regardless, of the purpose this design is cute. 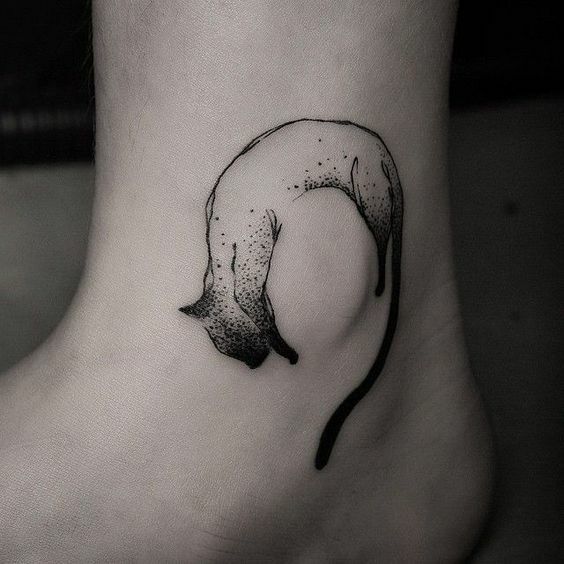 This is the most adorable ankle tattoos that will melt your heart away. The sight of sleeping kitten is always loved and it is a good way to keep this image closer to your heart or foot in this case. If you love cats, then this is a nice way to show your love and affection to these furry creatures. The only disadvantage of this tattoo is that you cannot rub the tummy of this cute puppy. 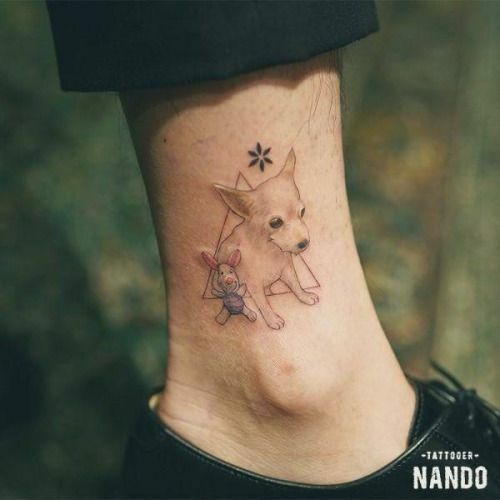 This cute tattoo for the dog’s lovers will keep you smiling whenever you look at it. 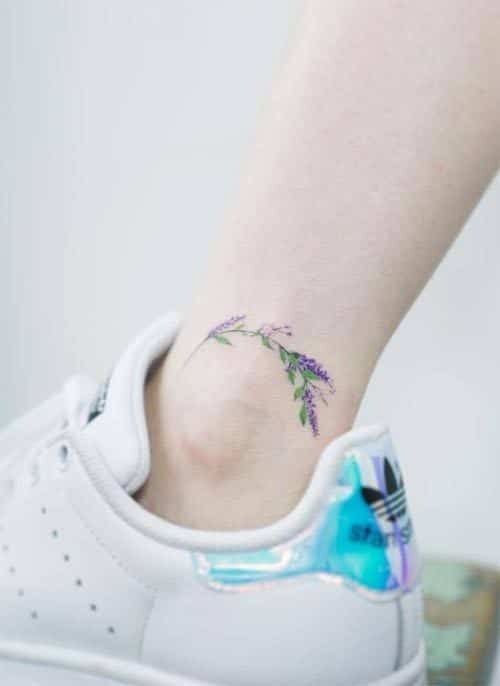 This is a nice and sweet ankle tattoo that enhances the beauty of your ankle with feminine lavender. The lavender color adds some color to your ankle, especially if you wear white sneakers. 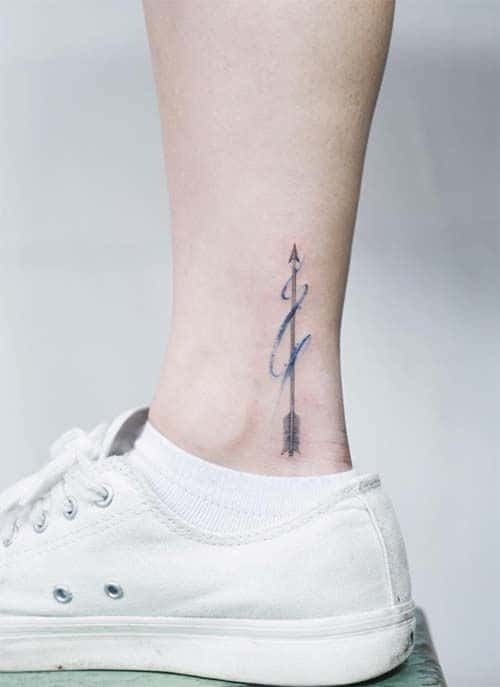 Arrows are used extensively in tattoo designs and this design is a sharp execution of the arrow. The vertical arrow looks quite interesting and the blue colored wrapping adds some color.